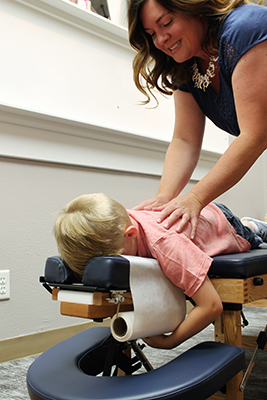 A simple check is all that’s needed to provide chiropractic care to children. The pressure used to adjust infants is the same used to test the ripeness of a tomato. We recommend that babies be checked as early as possible since the birthing process is traumatic. 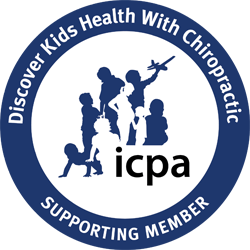 Dr. Rachel, who has trained with the International Chiropractic Pediatric Association, can make sure that there are no subluxations present. Subluxations are a lack of motion in the vertebrae, or bones of the spine. To remove subluxations, Dr. Rachel uses a light touch of her fingertips. The Activator® instrument may also be utilized. If your child is nervous, we’ll have them sit on a parent’s lap or ask you to lie on the table with your child on your chest. There are toys in each room that they can play with, and often it helps them to see Mom or Dad be adjusted first. Dr. Rachel is well-versed in working with children and will gain their trust before starting. 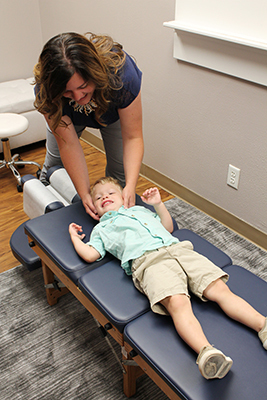 Dr. Rachel’s daughter, Willa, and son, Wyatt, have both seen the many benefits of chiropractic care. Though unaware that children could see chiropractors, her daughter had torticollis, colic, digestive problems and plagiocephaly (a misshapen head) as an infant, and brought her to the chiropractor. After Willa’s first adjustment, she sat up straight for the first time and napped for more than 20 minutes. After a few more adjustments, she no longer had colic and slept through the night, and her torticollis was starting to resolve. The doctors had said wearing a helmet would be required, but with doing stretching and strengthening exercises at home, they avoided this intervention. being held back by health problems. Contact us today to discuss bringing your child in to see Dr. Rachel for family health chiropractic care!